Holistic (or Integrative or Complementary) Veterinary Medicine is the examination and diagnosis of an animal, considering all aspects of the animal's life and employing all of the practitioner's senses, as well as the combination of conventional and alternative (or complementary) modalities of treatment. Use the guide below to jump to individual sections for fast reference. This mixture of healing arts and skills is as natural as life itself. At the core of this issue lies the very essence of the word "(w)holistic". It means taking in the whole picture of the patient?the environment, the disease pattern, the relationship of pet with owner?and developing a treatment protocol using a wide range of therapies for healing the patient. Yin-Yang theory maintains that everything is essentially composed of two opposing, yet complementary pairs of opposites. 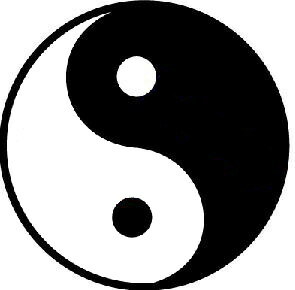 Yin-Yang theory can extend to TCVM physiology, pathology, pharmaceutics, diagnosis and treatment with acupuncture or herbs. From the "Red Book" The symbol is traditionally used to represent the interrelationship of yin and Yang. One can think of yin and Yang as a way of trying to understand the events of the universe by organizing phenomena into distinct categories. it is at once extrememly simple and staggeringly complex.